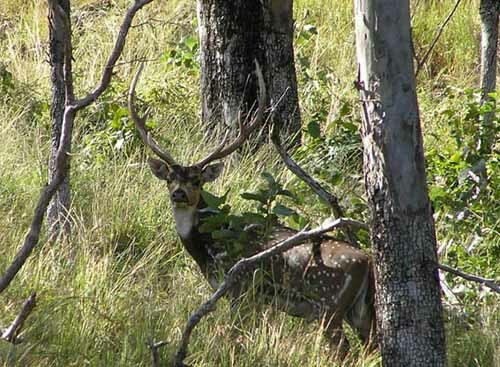 Axis (Axis axis)Appearance: Also known as ‘Chital’, the Axis deer is regarded as the most beautiful deer in Australia. Their reddish-fawn coat is covered in permanent white spots. Males make a long, wailing call in rut. Weight: 65-90 kgs (150-200 lbs). Antlers: Antlers are a beautiful lyre-shape, and are typically six points with the second tine inside the main beam. Trophy size: Mature males range from 25-30 inches in antler length. History: Introduced from Sri Lanka in the early 1800’s, they have thrived in the tropical parts of Australia and are often found in large herds. Hunting Axis in Australia: Axis prefer open terrain which offers good visibility. We do a lot of glassing from hill-tops and then stalk in. Large herds can make stalking difficult and longer shots are sometimes necessary. As is usual of tropical deer, breeding is year-round.